A bagel is the only bread product boiled first before baking, giving them their characteristic shinny appearance, warm doughy bite and crunchy crust. Packaged bagels are more like dense rolls than their authentic cousins. I used to live round the corner from Brick Lane in London where they’ve been making fresh bagels for over 100 years and there is nothing like a fresh bagel crammed with cream cheese for breakfast on the way to work. History has suggested that a Jewish baker in Austria made the first bagel in 1683 for the Polish King in the shape of a riding stirrup. They gained popularity as a gift for women in childbirth, as much as I like them, personally I preferred drugs when I was giving birth. They were and still are popular as a teething ring because of their easy to grip shape. In a jug mix the yeast, 100 ml of the warm water and the sugar. Leave somewhere warm for 5-10 minutes to rise, froth up and activate. Pour in to a big bowl with the remaining water, salt and half of the flour. Add enough of the remaining flour to form a dough ball - firm but not too soft and sticky - add a little more flour if needed. Kneed well for 8-10 minutes till it springs back - the dough should be smooth and slightly elastic. Place in a bowl and cover with a damp tea towel. Knock back (punch the dough down) and knead for a few minutes. Divide the mix equally in to 10. Roll each on in to a ball, flatten down slightly and make a hole in the middle with your thumb or a wooden spoon end - make the hole approx. 2-3 cm wide (I break the hole with my thumb and twirl it round one of my fingers to increase the hole size). Meanwhile bring a large pan of water to the boil with the remaining sugar added. 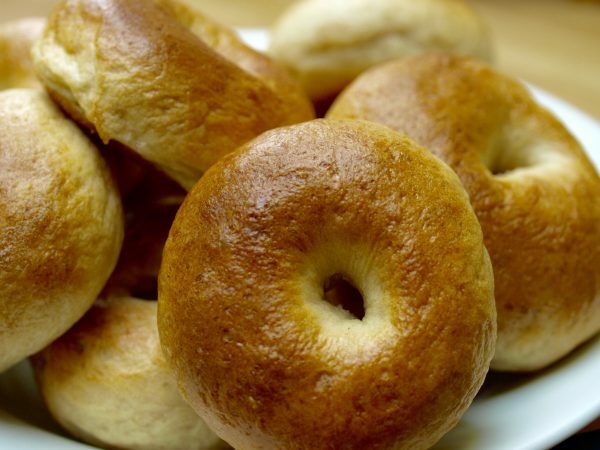 Boil the bagels in batches for 40-60 seconds on each side, turning with a spoon. Drain and place on a well-greased tray. Bake in a preheated oven gas 6 / 200*c for 25 minutes until golden. Or serve warm for breakfast with locally made jams, honeys or marmalades.